Synopsis- Francesca ‘Frankie’ Caputo has it all figured out. She’s finally going to marry the man she loves and then they will live happily ever after. But when a freak accident cuts her fiancé Alex’s life tragically short, all of Frankie’s future plans suddenly disintegrate. Drowning in grief, Frankie flees from her overbearing Italian-American family, and escapes to an abandoned cabin owned by Alex’s parents in a remote part of Washington forest. As her heart slowly begins to heal, Frankie discovers a freedom that’s both exhilarating and unsettling to everything she has always known for sure. So when her old life comes crashing back in, Frankie must decide: will she slip quietly back into her safe, former existence? 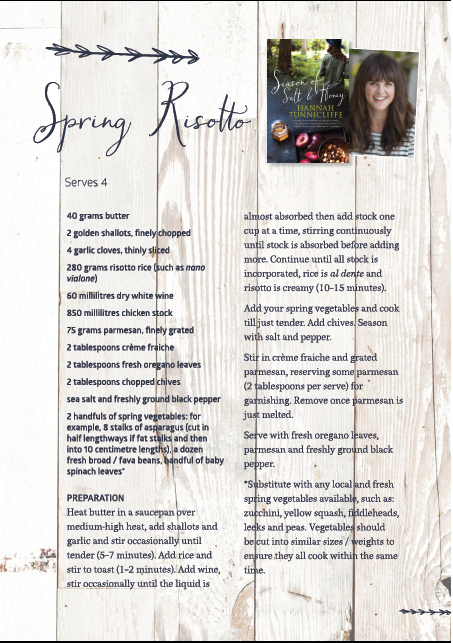 Or will a stronger, wiser Frankie Caputo stand up and claim her new life? 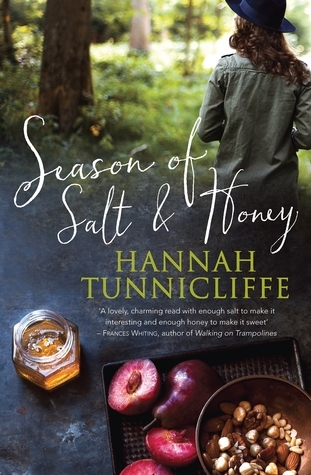 Review- Season of Salt & Honey is Hannah Tunnicliffe’s second novel and has stayed true to her style of incorporating intense human emotions, sound characterisation and lots of scrumptious food (and recipes!). Last year I read The Colour of Tea which is set in China; but the setting for Season of Salt and Honey is completely different. It’s in the Washington wilderness. Frankie Caputo is devastated by the sudden loss of her high school sweetheart and fiancé Alex. On the day of his funeral, she escapes the stifling indulgences of her American-Italian family and hides away in Alex’s family’s compact cabin in the Washington forest. It’s not long before she’s tracked down by Alex’s brother, her sister Bella, her father and a few opinionated Aunties. Despite their protests, she stays on and begins to come to terms, not only with the loss but the painful possibility that she may have lost Alex long before he died. Bella, her estranged sister stays with her, despite Frankie’s continuous rejection of her presence. There’s an interesting dynamic that develops between the two sisters as they get to know each other again, understand their past choices and find a way to move forward.The cabin is tucked away, surrounded by a little community that often has appearances from Merriem the informally appointed guardian of the community and there’s also father and daughter duo, Jack and Huia. I really enjoy Tunnicliffe’s writing style, the way the story slowly unfolds and with it each layer of the main character falls away until you discover their true fears and defenses. Frankie is a likeable character whose grief didn’t overpower the story, cleverly contrasted by bright personalities Bella and Huia. It was nice to see Frankie grow and develop throughout the story in such a small time frame. She keeps people at arm’s length which I found frustrating at times, but this was less prevalent as the story progressed. I’d really recommend Season of Salt and Honey.